Fortunately, the on-premises Exchange Server gives you many opportunities to get closer to a complete GDPR compliance. One of the features that help you achieve it is adding GDPR compliant disclaimers to your emails. Include an unsubscribe link. GDPR requires you to provide an easy way for your users to cancel consent for a subscription. Email disclaimer attached to every email correspondence is a perfect way to achieve just that. Learn how to configure a smart unsubscribe mechanism on your Exchange Server. Processing information. GDPR introduces Information obligation. Simply speaking, it states that you need to inform people you contact that you process their personal data (and how). This information should be easily accessible and clearly formulated. Including a link to your organization’s processing information makes it easier for your clients to learn more about how you ensure their personal data security. All information and attachments included in this email are confidential and intended for the original recipient only. You must not share any part of this message with any third party. If you have received this message by mistake, please let us know immediately, so that we can make sure such a mistake does not happen again and delete this message from your system. [Company] places the highest priority on the security and privacy of our Clients. Therefore, we have put our efforts into ensuring that this message is free of errors and viruses. Despite our efforts, you should always scan all emails for any threats with proper software, as the sender does not accept liability for any damage inflicted by viewing the content of this email. The security of your data is one of our greatest concerns. That is why we put extra effort into ensuring your data is always safe and up to date. Contact us if you want to access or change your personal information or if you want us to remove it completely from our database. If you do not wish to receive more emails from us, click unsubscribe. Here at [company], we care for your privacy. That is why we have taken appropriate measures to ensure that the data you have provided to us is always secure. If you have any questions related to GDPR compliance or data protection, please contact our Data Protection Officer. Our company is fully GDPR-compliant. 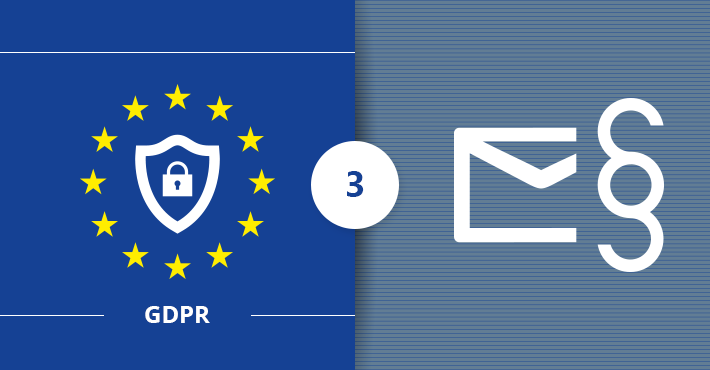 To learn more about how we comply with GDPR and, as a result, care for the security and privacy of personal data we collected from you, visit this page. Exchange Server offers you a native method of inserting disclaimers to emails. Please relate to How to set up email disclaimers on Exchange Server for a detailed guide. Signatures/disclaimers are not visible in Sent Items. Although server-side email signatures and disclaimers have a greater chance of being appended to outgoing emails, there is no native way to see them in Sent Items Because of that, it is hard to ensure if the GDPR compatible disclaimer has been successfully appended or not. Disclaimers and signatures are pushed to the end of the conversation. There is no way to insert email signatures and disclaimers directly under replies and forwards. This makes it harder for the recipients to find the unsubscribe link and any information you wish to convey through the disclaimer. To overcome those native limitations and unblock additional email processing features, you can use CodeTwo Exchange Rules Pro. CodeTwo Exchange Rules Pro is a mail flow and email signature manager trusted by thousands of Exchange Server administrators. The software lets you add server-side professional email signatures and disclaimers to your emails and comes with broadens capabilities of the native Exchange Server mail flow rules.